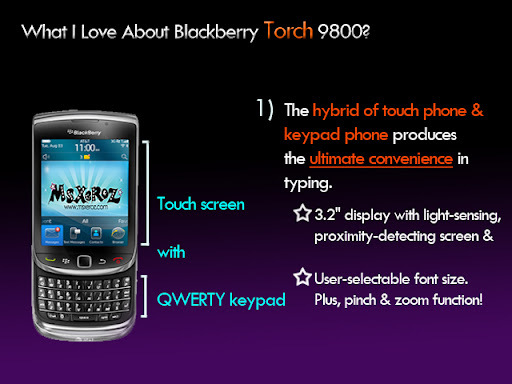 What I Love About Celcom Blackberry Torch 9800! I'm Nicole Chua. In the virtual world, I am known as MsXeRoZ. As happy as i usually am, my life is not a bed of roses. No doubt that I have one of the most flexible & fun job, but everyday I had to endure the hectic demands from work. Today, I would like to take this opportunity, to share with you the most miserable bits of my working life. I discovered that my main problem is INCONVENIENCE. Whenever my work has barriers, I am able to overcome it. 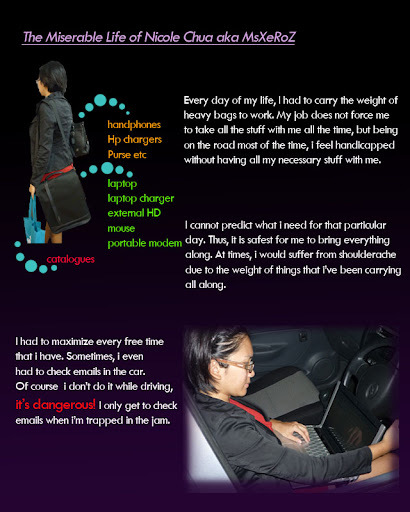 But, the inconvenience of not having the "ULTIMATE GADGET" is driving me crazy! 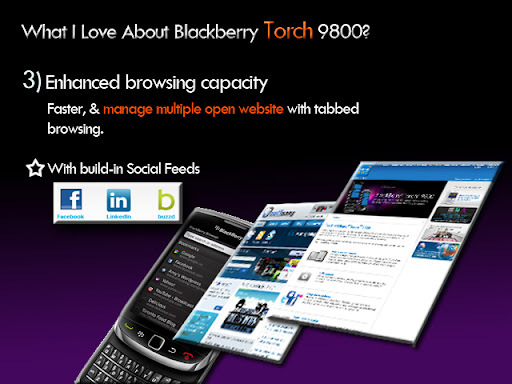 I first saw Blackberry Torch 9800 at Celcom website when I was paying bills online. One thing that catches my attention is the TOUCHSCREEN + QWERTY KEYPAD. And the first thing that came across my mind was "2 is better than 1". 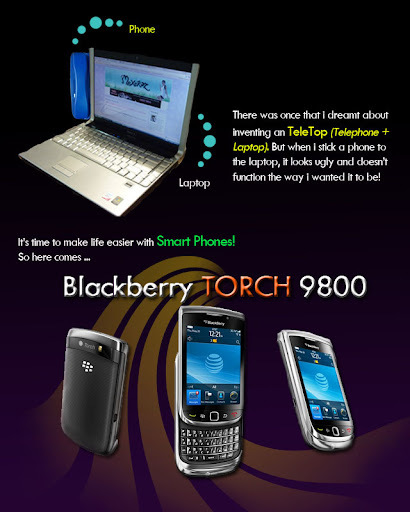 The 2nd time was when Nuffnang announced that Celcom is giving away 2 units of Blackberry Torch 9800 to Nuffnangers, I knew that I was destined to write this blog post. 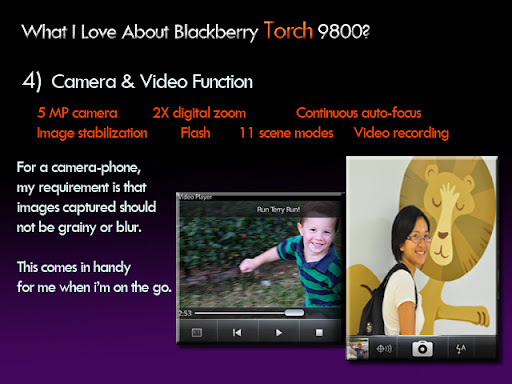 So, What is it that I love about Blackberry Torch? Having a smartphone is one thing, and fully benefit from its functions, is another matter altogether. Without able to use all of its function, there's no point getting a smartphone. That is why I need a telco plan to complement this Blackberry. Have you heard of the "Lock and Key Mechanism"? Well, that's what Celcom & Blackberry is! Blackberry is the "lock" and Celcom (as the key), fits the phone perfectly and unleash the true potential of Blackberry Torch! 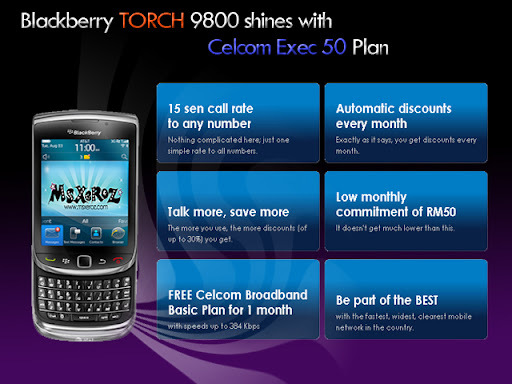 The blackberry needs an affordable data plan and call packages and Celcom's EXEC 50 plan is perfect for it! 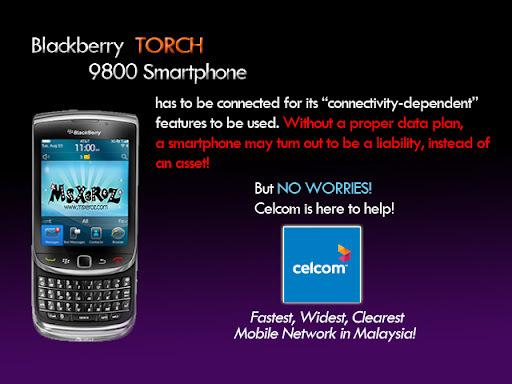 For me, Celcom Blackberry Torch 9800 SOLVES my INCONVENIENCE PROBLEM. 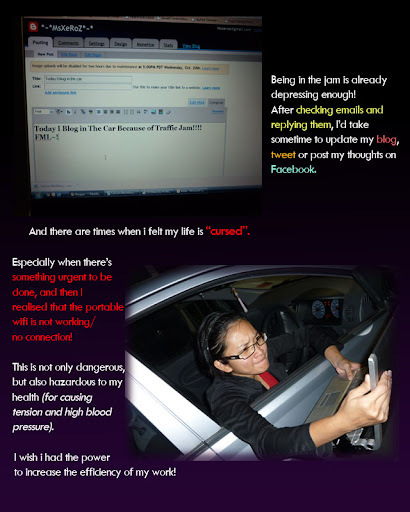 My work stress will definitely be reduced, and I can enhance my blog with it. 2. 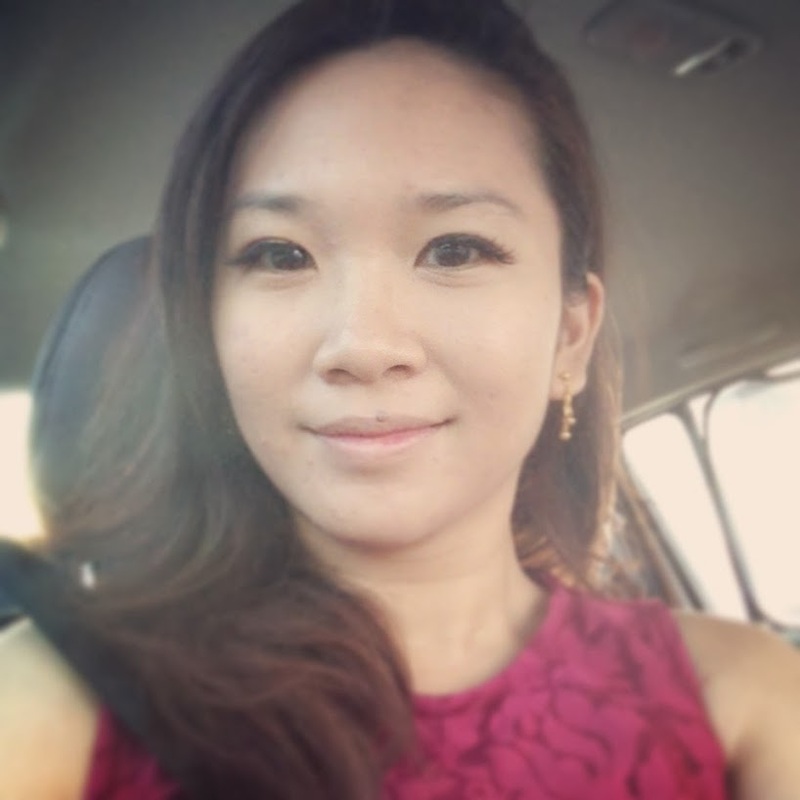 Snap pictures, mobile blogging, twitter, facebook and etc. 3. Voicecall, Video call and teleconference. 4. Listen to music during long journeys outstation. 5. Keep updated with the latest news feed. Woooahhh~ I can see how much easy it can be! No worries of not having connectivity because CELCOM HAS THE BEST NETWORK COVERAGE IN MALAYSIA! 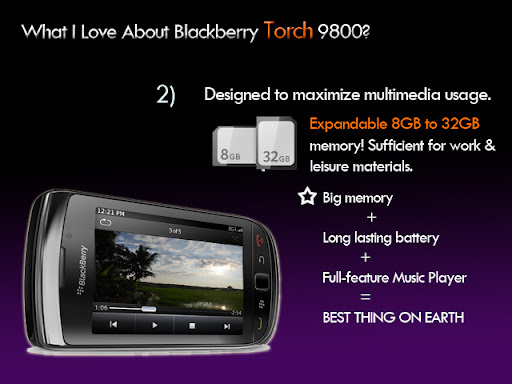 Thus, making it Malaysia's No 1 Blackberry provider, with the best Blackberry smartphones and plans! Celcom definitely know how to reward it's customers too! The Celcom Exec 50 plans starts with RM50 and customers will get to enjoy as much as 30% automatic discounts! 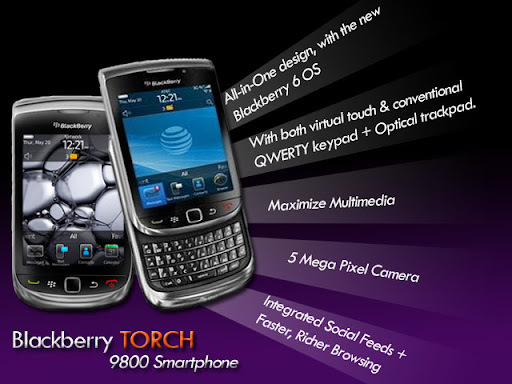 Blackberry Torch 9800 will be officially launched by Celcom on 29th October 2010. There's amazing deals when you sign up with Celcom during the event! So, keep on checking celcom's website here to find out what are the offers. There'll also be other fun activities, prizes and giveaways during the event. There's also other Blackberry Celcom Packages that is provided to cater your usage. Check it out here. If you still have doubts on whether Celcom Exec 50 suits your usage or not, fret not, just contact the Celcom Careline. I'm sure that the personnel will be able to help you. 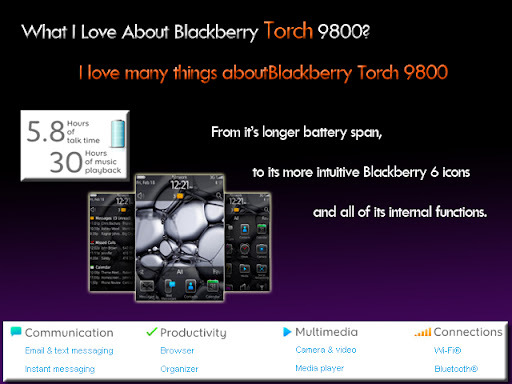 As for me, I'm definitely trying my best to get my hands on Blackberry Torch 9800. Hopefully there's a ray of light from the torch shines upon me. It's a Dinner Filled With CHEESE! You know when Halloween is approaching, the aura of fear will shadow over you. I was delighted to be invited over for dinner, and the guys promised us girls a good dinner. We watched movies while the guys (Raymond, Chan and XerOZ) cooked. For about an hour later, the meal arrived~!!! What we weren't told of was the theme of the dinner is "SPAM THE CHEESE"
Raymond prepared creamy mushroom soup. Thankfully it's the only dish that doesn't contain any cheese. Cheese Egg: The Single Cheese is good, the Maximum one is very yucky! The good side is it is nice to have people cook dinner once in a while. The bad side is, they are gonna do this until they perfect their Cheese Meal. =.="
Okayz, i better get going~!!! I got my MsXerOz.com name cards already. Wait for it to be unleashed yeh! A group of notorious robbers' (takers) job is to take all the cash and create a perfect crime scene, with detailed planning and left nothing behind. 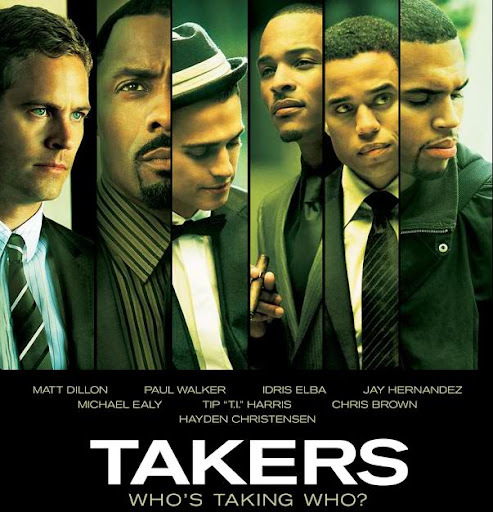 The Takers consists of John (Paul Walker), Jake (Michael Ealy), Jesse (Chris Brown), G (Idris Elba), and AJ (Hayden Christensen). They're being pursued by Jack (Matt Dillon) & Hatch (Jay Hernandez). Wanting to keep themselves low profile after a huge robbery, they're being offered and irresistible offer by one of their ex-member, Ghost (TI). How do they dodge the cops and pull out an almost impossible job? Well, you have to watch this movie for the answers. I don't know why but after watching this movie, i'd start comparing it with A-Team and The Losers. For me, Takers have a line up of good actors and simple storyline but it lacks the "bang effect" compare to A-Team and The Losers. The storyline also closely resembles "The Italian Job". Again and again, its about money, sabotage, cops and robbers (the same old story). Anyways, i did have a good time watching my all-time hero, Paul Walker! A bonus to that, this movie also features "the actor with the prettiest smile of all time" Hayden Christensen. Hayden's character, AJ would definitely look better without the ridiculous hat and bow tie. Add with a spectacles he'd look perfect! There's also 2 singers on board- Chris Brown (as Jesse) & T. I Harris (as Ghost)! It is very refreshing to see fresh actors portraying different roles. Nuffnang Glitterati Plus Club has NOW OFFICIALLY BEGINS! Well, as you know, Nuffnang is having their Glitterati Plus Open Meeting at Taylor Lakeside today. Glitterati Plus is a club that cater for active Glitterati members. Active as in, has the interest and commitment to attend to exclusive media events (like a job). So, bloggers who have the passion, or is a full time blogger, is more than welcome to join this club. Members with Glitterati status, will not be affected if they do not join the club. You know, sometimes we cannot be available for events during office hours. This club is a bonus. You will not be penalised or left out if you didnt join! Okay, after the briefing, we were served with refreshments. 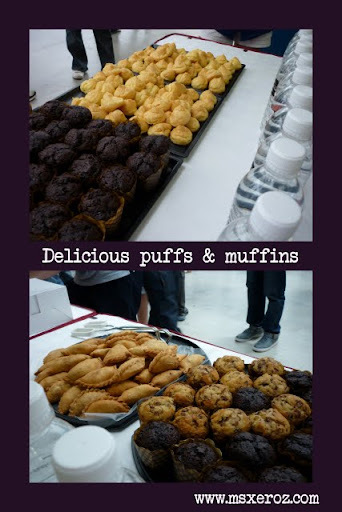 Thanks Atreyu Strange for providing such delicious puffs! At 1.00pm, we were guided on a campus tour! 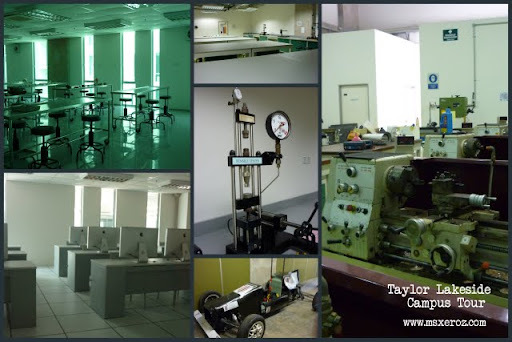 Taylor's Lakeside is an exclusive university. They have good facilities for their schools. Very impressive indeed. But i find that the corridors are quite "spooky". Not as in I can sense any spirits there. It's just dark and gloomy. I think perhaps they haven't completed the painting of the walls. Bright colours should be applied, not dark green/grey/blue. The weather was so hot~ we were all almost dying dried up in the heat. 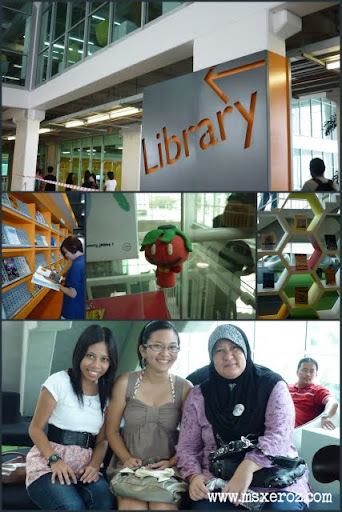 Thus, when we entered the library, WOAH~ what a fantastic moment. The aircond was very comfortable, many seats. The library is very beautiful! 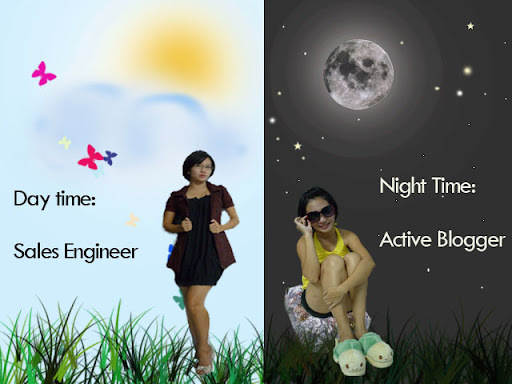 I can see that the has a very nice ambient for study environment. Nice, cute chairs, with comfy sofas. I would love to spend time in here too! Red Buttockz for one, has her buttock stick on to a cute toilet bowl-like chair. The Teh Tarik Memoirs was too, enjoying a larger potty like chair. Then we went to the hall and have our first ever LARGE group PIC! Then me and Redbuttockz went to have our lunch at Face2Face. Here the restaurant is self service. You have to order and get your number. Then wait for the number to be displayed and then you go to the counter to get your food. Quite an efficient system but the customer must keep aware of their numbers otherwise the noodle expand also nobody go redeem. I hate it when something like this happen? How can the straw be "imperfect"? Could it mean the straw is being "RE-USED"? Cut by both ends and serve the customer again? RedButtockz lips got hurt as she was drinking. Then she get another straw, but.. SAME! Why got sharp uneven edges of the straw? I hope Face2Face can rectify this problem. You don't want to injure anybody, do you? Here's a nice view on how the campus look like..
After our lunch, time to join the ChurpChurpers to fly kite! U la la~ I love her dress and it really accentuates her curves! It's cool for my 1st Churp Churp activity. Fly kite, i always wanted to fly a kite, but i forgot and wore a short dress. So all i could do is watch octopus fly! While Redbuttockz Wern did, manage to get one into the air! Ah..have a long day to face tomorrow.. So, how do you find my latest pattern? Im turning into pink again, this time with purplish hue. Something massive has happened. Look At The Brightside! (Sorry TianChad, steal your motto again!) I believe everything happened for a reason, every action has a reaction. I'll try to manage my archive again and relabel my existing posts (have 300++ to be relabelled). Why? Because when i started blogging, I don't know why labels are necessary, so i anyhow put a name. So this time, i wanna re-organise my blog layout, and there are too many non-related labels. Hope visiting my blog will make you happy too! 3. Here's one from Youtube. The cause for the massive accident is yet to be known (I guess it will remain a mystery). It was said that witness saw the bus wanted to overtake (move from middle to fast lane) and suddenly a car (CAR 1 in my previous post) entered the bus's lane and caused the bus driver to steered away in panic. Where is the driver/owner of the Car 1 mentioned? Is this a hit cause and run? Perhaps there are many more factors (internal and external) that caused this huge loss. I did mentioned about speculations and rumours and also questions unanswered. Well, several parties have defended the clean record of the driver. Some even said that the accident could be caused by crosswinds. Seriously, this is not only one of the accidents that is being "aggravated" by the guardrail. 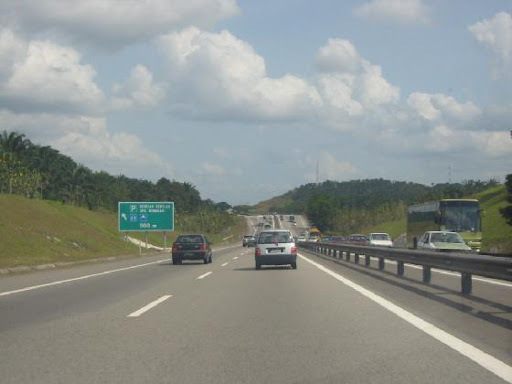 Guardrail are suppose to prevent any "unforeseen incidents" that cause vehicles to cross over the opposite direction of the highway. One of the representative of Pan-Malaysia Bus Operators’ Association said that guardrail is not strong enough, to stop the bus from crossing over. 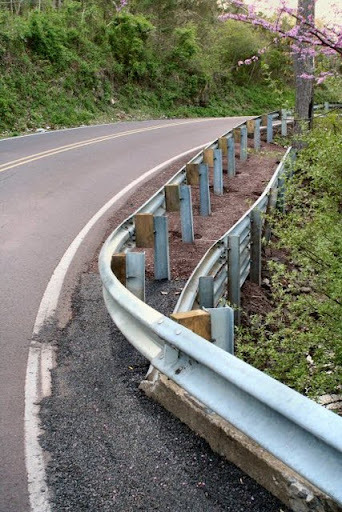 My opinion- Guardrail is important to serve its function. It's not only about the strength of the guardrail. It has to have the "elasticity" to absorb the impact of any crash. We don't want any guardrail which is strong, hard but easily fractured. The material should also be weather resistant, and the characteristic of the materials is not lost with time. Hmm, I know it's easier said than done, but i think it can be done with proper R&D. For those injured, take good care! Wishing you a fast recovery. Delima Express heading northbound--> crashed the rear of a car (1) --> Delima Express lost control--> steered sideways--> rammed into the guardrail--> into the opposite lane-->Crashed into a Toyota Hiace (2) heading southbound--> Myvi (3) cannot brake in time upon seeing the Delima Express on the fast lane & bang straight into the Delima Express--> Honda Accord (4) behind the Myvi, cannot brake in time as well & bumped into the Myvi --> Welfare Department Bus hit the Delima Express which was blocking the 3 lanes from the southbound direction--> 12 fatalities recorded and 50 others injured. 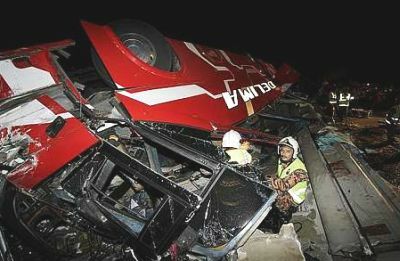 Now, i have read the news from various sites, and no doubt, this tragic accident had sparked the interest of the public. 1. Delima Express was speeding. It was on the fast lane on the highway. 3. That stretch of road is haunted (km223 northbound). 5. 101010 is a auspicious date, but that particular time is the "dark" period. 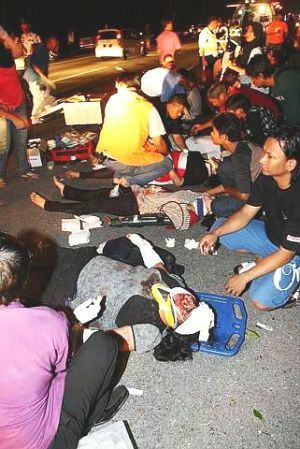 When such tragic incident happens, we find the cause of the accident. And then, we tend to make conclusions. Once conclusion is made, someone has to be blamed, and this time it's no other than the dead bus driver of Delima Express. I'm not one of the staff of Delima Express, not a family member/friends of those involved, and neither was i at the accident scene. I would not pass any judgement on this issue. But i have questions; questions that i hope to seek further understanding on why this tragic accident occur. 1. Was Delima Express speeding? How fast was it? 2. What is the health condition of the driver? 4. It was reported that Delima Express crashed the rear of the car (car 1 as in my summary above). 5. What is that car 1? What happened to car 1? Where's the driver of car 1? 6. Assuming that the Delima Express was speeding and crashed on Car 1. Passengers and driver of Car 1 would have been killed, or injured. I couldn't find any information on Car 1. 7. The traffic on Sunday evening is normally heavy towards KL (people getting back to work on Monday). Is there no other eyewitness on what happened to Delima Express prior to the crash? The only witness claimed that Delima Express was speeding also said that she was asleep before the crash. Was there anybody who was awake at that time? 8. What about the traffic monitoring cameras? I usually see the cameras along the NSE that monitor the traffic flow. Can the bus be detected? Maybe we can even see what happened to the bus that it flew to the opposite direction. I'm not a detective, but I'm just a curious person. 12 lives gone, and people injured. I just feel this incident should not remain a mystery. Answers should be given to the family of those affected, so that they should understand what actually happened. I hope that Malaysia's CSI team would act fast, but with detailed analysis and provide to the nation the answers to my questions. Accidents do happen. We cannot predict or prevent. All i could advice is for us to do more good things in life and treasure it. Be careful on the road. Information and sources for my summary taken from The Star & NST. Hmm, should i send my RedButtockz Wern to bus station tomorrow? She's going back to Ipoh. Okays, time for bed. 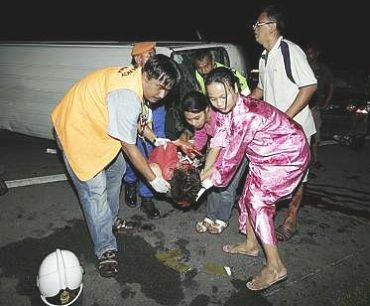 I pray for the fast action of M'sia CSI team, fast recovery of those involved, and may those departed rest in peace. During my childhood times, one of my favourite movie is "The Never Ending Story". I wished that one day i would somehow have the opportunity to experience the unforgettable, a story that will never ends. My wished came true. On 23rd September to 28th September, the experience, fun and adventure that is a never ending story. 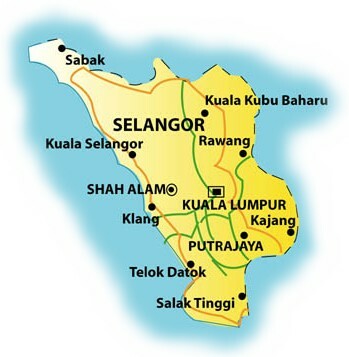 This time, IT IS MY STORY, OUR SELANGOR STORY. Its scary but fun, happy but tired! Ladies and Gentlemen, this is may be the ending of My Selangor Story. but the bond that we shared, is a NEVER ENDING STORY. Day 4: Doing The Unbelievable!